In this premier episode of the Collective Wisdom podcast you’ll learn about the fine art of fundraising from a CEO who has raised over $20 million dollars to date. You’ll learn how pitching a VCs is different from pitching Mr. Wonderful on SharkTank, how to plan a fundraising process like a US Marine, and how dressing like a hobo is the key to success. Don’t have time for a podcast? You’re in luck! We have also prepared a transcript with links, highlights, and other audiovisual wonders for your skimming and sharing pleasure. MR: Entrepreneurs may glorify fundraising. I know I did, but as you heard, it can often be a crappy job. 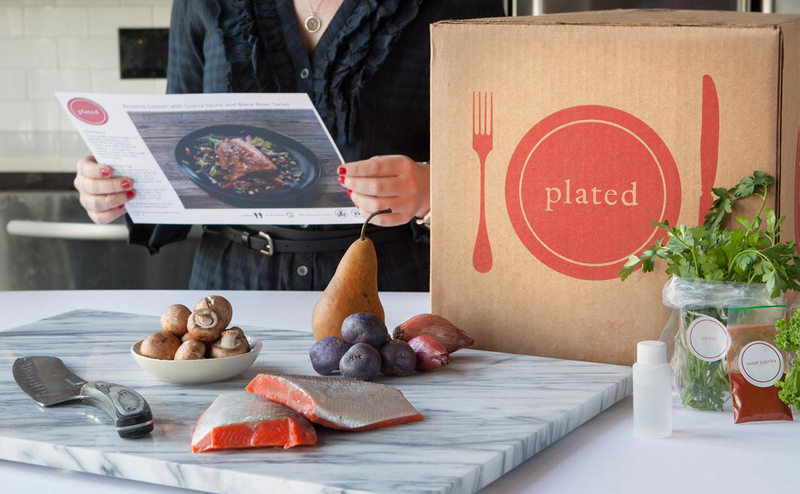 Plated is an impressive company. 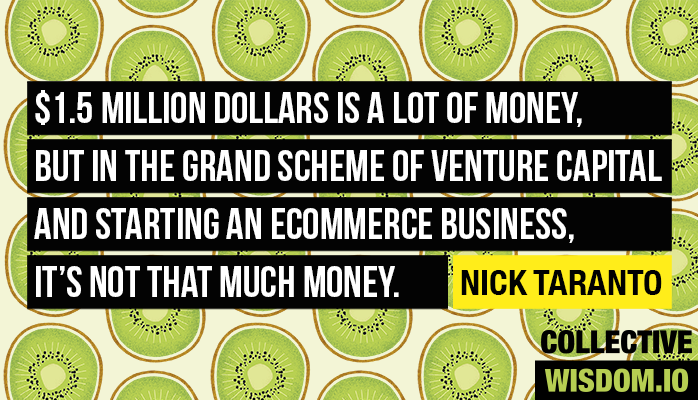 Nick and his co-founder, Josh, have raised over $20 million in venture capital to build a new type of grocery store. In their vision, instead of waiting in a checkout line behind screaming children, you go to a website. You choose from a curated list of mouth-watering meals, like Trout Teriyaki or Southern-style Shrimp and Grits, and Plated sends you all the ingredients you need to cook it in a box. You just cook it up, you use their custom recipe cards and videos, and in about 30 minutes or less, you get a home-cooked gourmet, quality meal. Here’s what it sounds like when someone first opens a box from Plated. This is what a Plated shipment looks like. It’s pretty boss even if you’re not a hand model. Meg Wiley: My name is Meg Wiley. I’m going to start opening up my box from Plated. Look at this, something really unusual. This is Skate Wing Schnitzel. I have my panko, which must be for the fish. They even give me the butter. That’s amazing. These are things that I definitely wouldn’t make on my own because where the hell do you get skate? That’s what I’d like to know. There we go. I have all my ingredients ready to roll, so now all I have to do is cook and serve. MR: As cool as Plated is, it’s a hard business to raise money for. Most VCs want to invest in the next Apple, not a company that sells apples. They need to build distribution centers and hire hundreds of workers to ship thousands of meals. The logistics are actually quite complicated, and all this takes a lot of dough. Okay, sorry, bad pun, but it’s expensive. It hasn’t always been an easy road raising money for Plated. Nick and Josh have been able to weather it despite all that by pitching venture capitalists, angel investors and, of course, spoiler alert, Mr. Wonderful. 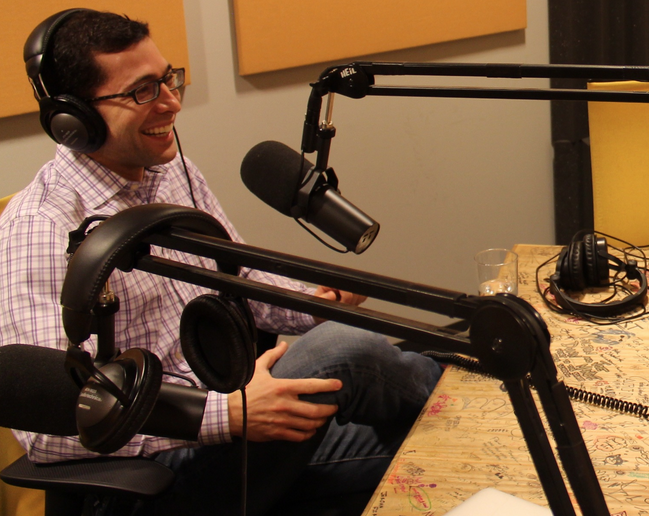 Let’s talk to Nick about the ins and outs of fundraising for Plated. You’ll learn what it’s like pitching on “Shark Tank,” how to plan the process like a US Marine, and last, how dressing like a hobo is the secret to securing funding. First of all, welcome to the show, Nick. NT: Thanks Micah. Good to be here. 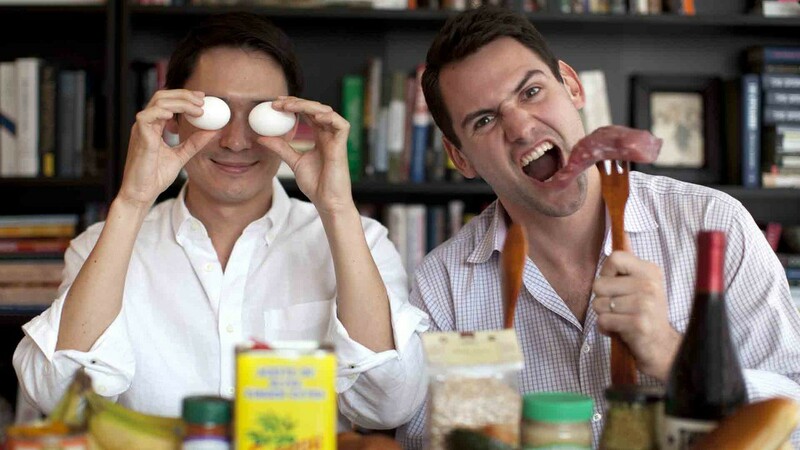 MR: Plated was founded in 2012 when you and Josh Hix were students at Harvard Business School. NT: We went to school together. We met at Harvard Business School in 2008. We actually didn’t start this until two and a half years after graduating. We went our separate ways. Josh was working at a hedge fund for a while, then started his own piece of advertising technology, which he sold. I went to the Marine Corps and then wound up on Wall Street working at Goldman Sachs. It was then, Josh and I were in New York, I was chained to my desk working 12 hours plus per day eating greasy Thai food from Seamless, that we stumbled upon the realization that there was a big opportunity here. It came from two basic insights. I had just gotten married a few months before, was living with my wife who was also working long hours. MR: Was she eating the greasy Thai food as well? NT: She was. She’s more of a health nut. What would happen is she would cook up these huge batches of vegetarian chili on Sunday nights and we’d eat that for the entire week. It’s good chili, but by the end of the week, you’re like, “Dude.” One insight was we were trying an easier, better, more affordable way with less waste to cook. Because we would go to Whole Foods on a Saturday, spend 100 bucks on groceries, cook one night and throw out half of what we bought. It was not efficient, not a good experience standing in line at the grocery store, so we knew there was an opportunity for a better experience. Then we also started looking at the broader food market, which I had never looked at before. I wouldn’t even call myself a foodie, let alone a chef. I’d never looked at the food industry in my life. Once we started peeling back the onion, just the size of the opportunity was fascinating and crazy. Dinner alone, in the United States, is a $414 billion industry every year. There’s really nothing like food, and add to that this layer of intrigue, which hadn’t really been innovated … The food industry hasn’t been innovated upon in decades. If you think about standard eCommerce today, you buy your books, your makeup, your electronics all online. Less than 1% of food is bought online. We thought if you were going to build a food business from scratch in 2012, what would this look like? What would a Whole Foods look like if you were building it again from scratch today? That’s what we set out to do. MR: One of things that’s so fascinating about the Plated story has been the fundraising process. Take us back there. How’d you get going and get the initial dollars to start? NT: Now that we’re almost 400 employees … We’ve got four fulfillment centers across the country. We’re shipping hundreds of thousands of meals to all 48 states, or the lower 48 states. We’re doing it in a big way now, but it was not, to your point, a straight-line trajectory. We had a hell of time getting this business off the ground at first. I’m a first time entrepreneur. Josh had started a couple other businesses, but not in food or eCommerce or the consumer space. We were trying to build a consumer, food, eCommerce business, and we had no experience whatsoever. We knocked on about 150 doors when we were trying to get this business off the ground. We needed money, right? We don’t come from wealthy families. We started this on credit cards and savings. We liquidated 401(k)s and IRAs to start. We very quickly needed to raise external money. We went out and knocked on 150 doors, got a 149 no’s. The one yes was from my dad. 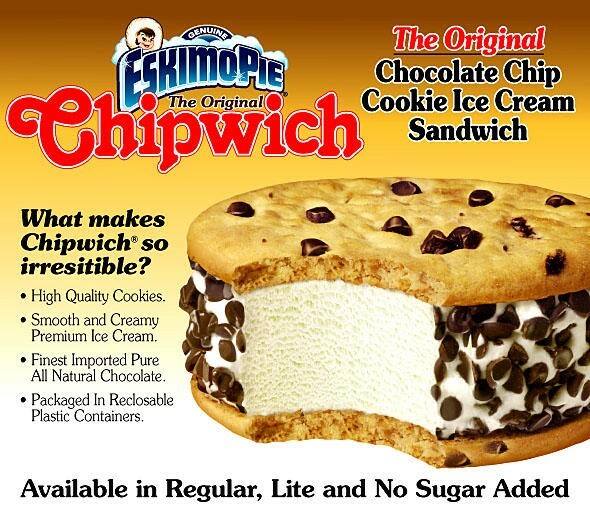 Just to give a little example, you know what the Chipwich is? MR: The ice cream sandwich? NT: Yeah, yeah, the ice cream sandwich. Somehow, I don’t remember how, I got connected to the founder of the Chipwich. MR: Because you’re trying to get any contact in food you can come up with. NT: There’s a guy and he invites you up to his apartment. It’s this $30 million, Park Avenue apartment. He’s got a personal chef and maids. We’re sitting at his kitchen table, and I’m giving him the spiel, sitting in his black turtleneck, and he’s like 85 years old at this point. I’m halfway through the pitch and he just interrupts me and goes, “You know how many Chipwiches I sold?” I go, “No, sir, I don’t.” He goes, “A billion!” “Uh, that’s great.” He goes, “You think you can sell a billion of these meal kit things?” I go, “Uh, yes.” He goes, “No!” And that was the end of that conversation. NT: It’s a riot in retrospect. MR: I’m sure at that moment you felt like at least it seemed like a hope, right? MR: Here’s a guy in the food business who made it. NT: Yeah, made it. He’s got money. He could write the check that gets this business off the ground, and, boom, it falls flat. 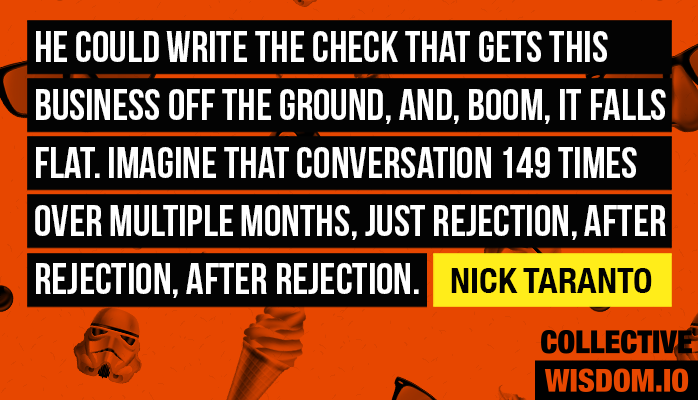 Imagine that conversation 149 times over multiple months, just rejection, after rejection, after rejection. MR: You probably went to people from the food industry. It sounds like you sought them out. Were they easier or harder? It sounds like in some cases they were harder to pitch because maybe they knew where the bodies were buried and the difficulty in launching a business in their industry. NT: Yeah. I think that’s a really good point. Because we knew nothing about food, we were naïve, and we were willing to do things that other people had maybe tried and failed at a decade prior. We didn’t know that, so we went out and just tried to make this thing work. Whereas people from the food industry had preconceived notions and would come to us and say there’s no way this is going to work. I’ve seen this tried before. I’ve seen some iteration, and it’s just too hard, or whatever their excuse was. MR: So, Nick, you go to Papa Taranto. Do you do a formal presentation? Do you and Josh sit down and walk through the PowerPoint or …? NT: We didn’t pitch that. It was more just we’re working on this thing. We’ve got confidence we can make something happen. He wrote us a check from his personal account. Now that check is worth 300 times as much. MR: Who was the first non-family member to write a check? NT: Yeah, exactly. They wrote us our first substantial check, which was for $350,000. MR: Was it your background that resonated or was it the pitch? I mean you had been a Marine. Did he connect on the military experience? Was it, again, belief in the founders? Was there something about the business that just really struck a cord with those guys? NT: They liked food. These are tech guys, and they had the same insight that we had which was this is broken and it shouldn’t be, and we can use software and data to fix it. But at this point, we had no revenue. We came out with this half-assed constructed box that we had designed on my couch. For them it was really taking a flyer on us. MR: You and I met in a, I think, warm conference room at Techstars, which was an accelerator for tech companies. I remember walking in and, I think at the time, you had eight or 10 people … You definitely had more people than any other team there. You guys were actually operating a business, where a lot of the other guys were incubating a business. What was that experience like? What motivated you to apply to Techstars? NT: We were looking for a leg up and support wherever we could find it. 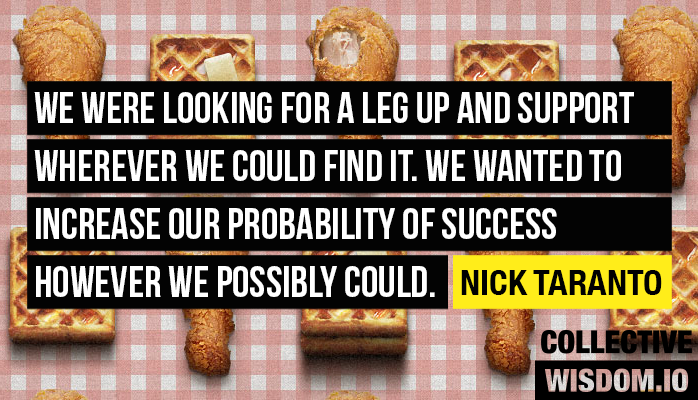 We wanted to increase our probability of success however we possibly could. The way that Techstars and most other accelerators work, they take a piece of equity. In Techstars case, it’s 6%. They take 6% of the business. They put you through a 12-week super rigorous, 24/7 program. At the end, you do this pitch to several hundred investors and the idea is you accelerate the business. You raise your seed round. It can be a couple hundred thousand up to a couple million bucks, and that’s your catalyst or springboard to become a real business. MR: Was the goal more about helping with the building of the business and operations and marketing and that stuff? Or was it really about fundraising or both? MR: But you had been operating the business, right? You were shipping meals at the time. MR: Did they feel like there hadn’t been enough progress? Were they …? NT: Yeah, exactly. They felt like we were burning money too fast. There hadn’t been enough progress. We were doing something like $2,000 in revenue a month. Nothing to get excited about especially given that they committed $350,000 already. MR: Do you think the fact that they’re tech investors traditionally, that not seeing how hard it is to build a real sort of brick and mortar business upfront, may have also sort of played a role in there? NT: I think it’s definitely part of. Coming from a software background, you’re used to shipping bits and bytes. 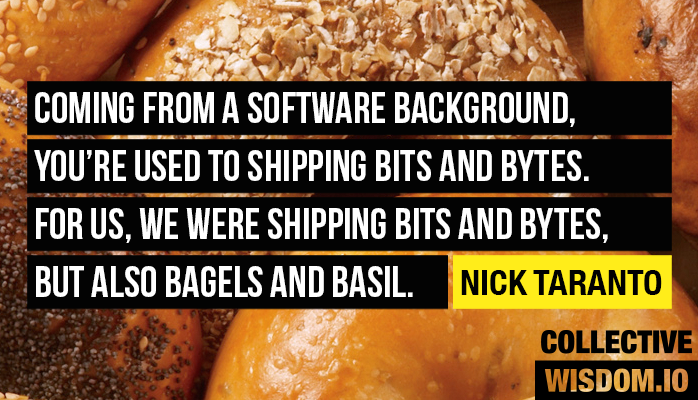 For us, we were shipping bits and bytes but also bagels and basil. So we had a lot of complexity. We had to hire people to perform $12 an hour packing work. We’d never done that before. We’d never hired a labor force and had to manage for quality control and never had to order thousands of boxes and insulation and figure out R-factors and all this stuff. We’re just learning on the fly, and learning was expensive. MR: I remember I met you and I had recently been talking to a company doing something similar. I had been thinking this category’s right for something different. I remember walking through a grocery store. I was sort of making fun of the fact that everything had been pre-chopped. To see onions pre-chopped, it’s amazing. How hard is it to cut a watermelon? But that’s really what the consumers want. I think something clicked. We met, and actually I remember my partner, Eric, met with your co-founder, Josh. Then we compared notes and got excited. Now the rounds starts to come together. How much business were you do at the time of the seed round? I want to say 25 to 30,000 a month. Is that about right? NT: Yeah. When we came out of Techstars, we were doing $75K a month. That was end of June 2013. MR: How much did you raise in that first seed round with ff and us and some others? NT: We raised a million and a half coming out of Techstars. NT: Well, sort of. It was sigh of relief because we knew we weren’t going to go bankrupt tomorrow, but we also knew that we had a lot to prove. You joined our board. John joined our board. So there were some real, real intense performance expected from us. A million and a half dollars is a lot of money, but in the grand scheme of venture capital and starting an eCommerce business, it’s not that much money. We projected that would take us nine months. In reality it took us six months. Yet again, within six weeks of closing that round, you remember, we did new projections. We projected that we were going to run out of money again. We basically, for the first two and a half years of the business, there were about six days when we weren’t fundraising. For us, fundraising was a nonstop battle to get the business off the ground. The Plated Founders Nick Taranto and Josh Hix pitching the Sharks. MR: I remember in the process of our discussions for that seed round, at one point, I don’t remember exactly when, you said, “Guys, there’s this possibility that we might be on this show “Shark Tank.” I think you guys had gotten a call from a producer or something and found out about your story and said, “Hey, would you guys be interested in this?” How did they find you? How did you get hooked up with them in the first place? NT: Part of being in Techstars was getting media exposure. Techstars is a New York City tech darling. We got Wall Street Journal coverage, New York Times coverage. We were on Bloomberg, MSNBC, Fox News. We did a ton of TV. Somewhere along the lines, a “Shark Tank” producer saw us, reached out cold. They basically said, “We love you guys. We think you’d be a perfect fit. We like the business. You guys should apply.” Then the weekend after we finished Techstars, which was July 4th weekend, instead of celebrating eating burgers and hot dogs and beer, we flew out to LA and filmed “Shark Tank” in July of 2013. MR: I remember we had a phone call just before then, and you guys were nervous about what to share. I think you were nervous about even whether it was even the right thing for the business. How did you get ready for all this and think through all those issues? MR: How wrong whoever … It wasn’t me. MR: Yeah, exactly. It turns out that prime time TV is actually quite valuable for consumer products. MR: By the end of the episode that we saw as viewers, you hug it out with Mark Cuban. NT: We did. We did. We did a deal on air with Mark Cuban. MR: When the show aired, you guys had a giant party at the office in New York. Those of us that weren’t there were glued to our television. I got an email that said, “Oh, no, the servers crashed during the show.” You guys got so many hits, so much inbound the moment that episode aired and your name was on the screen. You guys weren’t even prepared for the level of the spike you would get. NT: We filmed in July 2013. Then it didn’t air until April 2014, so a full nine months passed by before we actually aired, so we actually had a lot of time to prep. We were only operating in New York when we filmed. By the time it aired, we were in New York, Chicago, and California, so we had nationwide coverage. MR: It was a different business. MR: Nine months in the life of a startup could be … They say startup years are like dog years, one year could be seven. MR: Truly. It definitely feels that way. We were somewhat prepared I would say. We talked to other “Shark Tank” companies and talked to them about what they had done to prepare their servers and their websites for the surge of traffic. To give it some context, at that time the most concurrent visits we’d seen to this site was about 500 concurrent visits, and that was after a big Wall Street Journal article. When “Shark Tank” aired, we surged from a baseline of about 50 concurrent visits to over 60,000 in about 45 seconds. NT: On the site, yeah. MR: … in less than a minute. That’s truly amazing. NT: It took down the main site. In the case that we went down, we had a landing page to capture emails. Then that went down after a subsequent 90 seconds in which we captured thousands and thousands of emails. Skip to 21:52 to see the Plated team in action. MR: When you guys were pitching the judges, how similar or different was that from raising your seed round? Did you have as much time to get into the details? NT: We had the benefit of having pitched you guys and literally hundreds of other investors at that point, so we had a really tight spiel. It felt in many ways like the “Shark Tank” crew was lobbing softballs at us. It’s entertainment, right? Their job is to create entertainment so that they can sell ad dollars against the show, so a lot of the questions, relative to the ringer that you guys had put us through, felt pretty dumbed down. MR: There was no spreadsheets. You didn’t have to boot up a PowerPoint or follow up with lots of due diligence. That’s not really part of the program, right? MR: Subsequent to the show. NT: Subsequent, but on air … you’re in that tank for about an hour, and they cut it down to a six or seven minute piece. You go into some detail but certainly no Excel models or PowerPoint presentations. MR: After the show airs, you guys get a ton of exposure. You still found it hard to raise capital. You needed more capital after that all, after the million five had been mostly gone through. I remember some pretty dark days. Why was it so difficult? 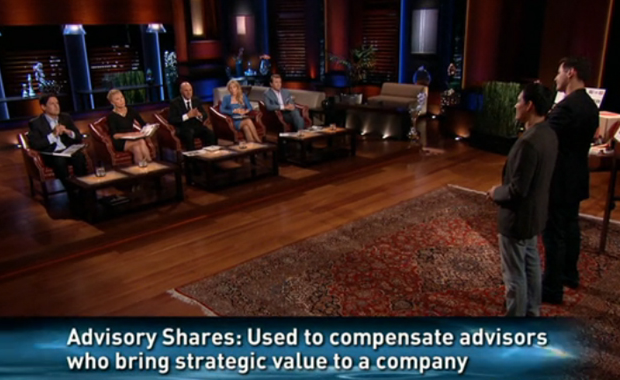 Was “Shark Tank” … did it have a positive or negative effect on other investors? Were there some other things going on that made it challenging going forward? NT: In between filming and airing, we needed to raise more money. “Shark Tank” had not aired yet. We didn’t have that lift. We were running out of money yet again. 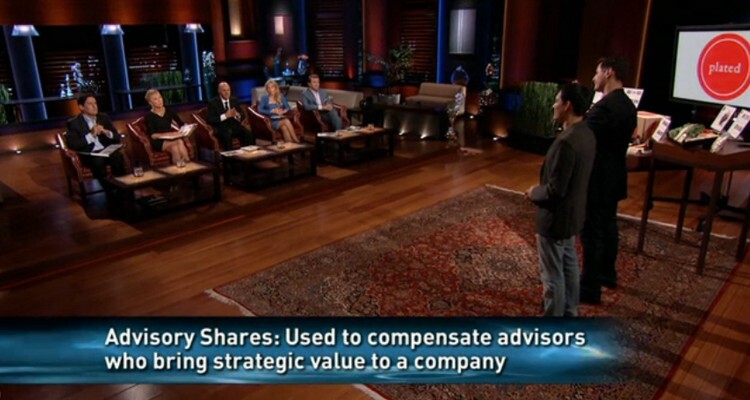 MR: So the promise of “Shark Tank” was one of the points of the pitch. NT: We knew it would move the needle, but we didn’t know when it was going to air. They only gave us a week’s notice when it aired, so this was just hanging out there. Towards the end of 2013, we were running out of money again. We actually had a signed term sheet, you remember this well, with a growth equity VC. We were five weeks into due diligence, and we didn’t have much cash in the bank. We had, at the time, about 10 days of cash in the bank. This investor pulled out at the last minute and basically left us holding the bag. This is in mid-December as well, which is the worst possible time to be fundraising because everyone is traveling or on vacation or on holiday, not responding to emails. We had to lay off some people, which was the worst day in my professional experience so far. Lay off really good people who signed up for the mission and signed up to join us and trusted us, and we failed them. That was a really tough time. So laid off about 10% of our staff. Then we basically had to scrabble together $10,000 checks over our Christmas and New Year break. We just spent the holiday dialing for dollars to keep the business alive. It was not a bright time in the Plated history. MR: It sounds like the “Shark Tank” experience is you pitch to four judges, four sharks, and you walk away with an answer. Obviously it’s reality television, but in the real world, it sounds like you literally can knock on hundreds of doors and that the process is just really drawn out. It’s almost like, for the investors, time is on their side, and they’ll wait as long as they can to make a decision. Unlike the show, where you see a couple decisions before the end of the hour. 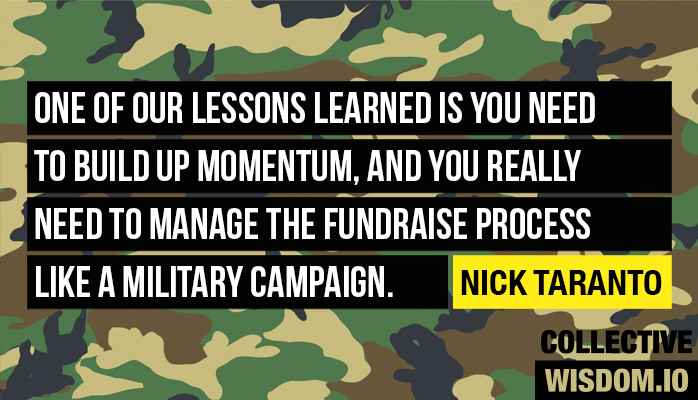 NT: One of our lessons learned is you need to build up momentum, and you really need to manage the fundraise process like a military campaign. You need to know who you’re targeting. You need to have your A tier, your B tier, your C tier, and you got to just run a super tight process. Constrain your conversations to one or two weeks, get people to answers, build up some heat and momentum. Otherwise it can drag on for months and months and months, and that can kill a deal. MR: Is fundraising a lot like sales when it boils down to it? What you describe sounds a lot like managing a funnel, figuring out who your targets are, tracking it, moving it forward, you said, like a military campaign. It sounds like a lot like enterprise selling. NT: In many ways it is. You cast a very wide net especially in the early days. As you get later into the stage of the business, you talk to more specialized people, so your hit rate increases. But in the early days, again, we talked to 150 people to get one “yes.” Those are not very good odds. MR: Late last year, you raised $15 million. Did that process get easier? Was it different given the size of the amount of capital you were getting in and the types of investors you were pitching? NT: We raised that 15 million in July 2014 off the back of “Shark Tank.” When “Shark Tank” aired in April, we did more revenue in the month that followed, the 30 days that followed than the whole history of the business combined prior to that. MR: It sounds like one of the lessons you learned is raise on the upswing, not when you need it but when you have momentum at your back. MR: And December is a particularly bad time to be raising. NT: Horrible, for any business. It is pretty crazy though how the markets just shut down or cool down during December and August. So it’s understanding how your business works and how the investor cycle works is really important to raising money. 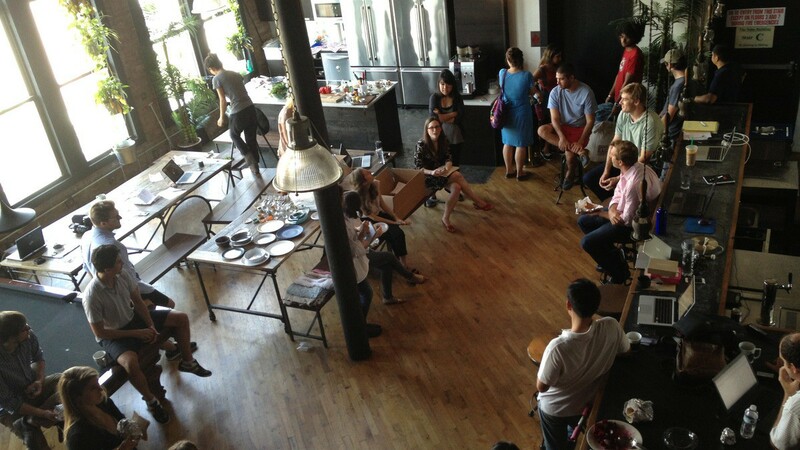 A small team meets at Plated’s Manhattan HQ. MR: Nick, what’s been the most surprising thing about all this fundraising? It sounds like one of the most interesting points you’ve made is that you’ve basically been fundraising the entire business with the exception of, you said, six days or something. What’s been most surprising besides just how much effort it’s taken? NT: I think the most surprising thing is just when you’re … especially as a first time entrepreneur. I am a first time entrepreneur, so this is the only experience I have. It’s surprised me how much your personal story and your personal energy matter in doing the raise. Because even when you’re raising $15 million, the investors are making and placing a bet primarily on you and the founding team as jockeys to run and usher the business. The fundamentals do matter, but much, much less than you and your founding team and your executive team as leaders and executors. MR: It sounds like the fundraising process is almost like an interview, more so than even a discussion about the business. The business is important but it’s getting to know the individuals on the other side, the entrepreneurs and what motivates them. Is that your experience? NT: I think certainly for the best investors, yes, that is the case. They want to get to know you, what motivates you and drives you as a person. Some of the best questions I’ve got are why do you get up in the morning? What are you working on here? Is it just dollars and cents? Or it is something bigger that’s going to keep you driving and hard charging after the millions start pouring in. MR: And you were just sick of greasy Thai food. That’s why you were doing it. NT: I think that, both for investors and for employees and for customers, having a mission is really important. Having not just a ‘what,’ but a ‘why’ behind the business is really crucial. We’re seeing that now. We’re able to recruit the best talent. Because, at the end of the day, if you’re smart and hard working, you can make money almost anywhere, but you want to come to work every day and work with people who you love who are passionate, and you’re working on something bigger than yourself. That’s what we try to build in with our mission around helping people eat better and live better. MR: In broad strokes, Nick, how big is the business today, sales-wise, the amount you ship? NT: Let me put it this way, today during the lunch hour that we’re here, we’ll do more revenue than the entire month two years ago. NT: It’s truly been exponential growth. NT: One hour will be equivalent to a month. MR: … a month two years ago, amazing. NT: Yeah. We are shipping hundreds of thousands of meals across the country every week. We’ve put over 400 people to work. Created over 400 jobs across the country. Four fulfillment centers with hundreds of thousands of square feet of real estate online. Things are working. MR: The news story to investors is this is the next Whole Foods or even bigger. This is the next category, the next way consumers are going to buy food. NT: That is what we have proved in the last few years, that this is a new behavior, and it’s a new category or maybe even a new market. Goldman Sachs just came out three or four weeks ago and said that they think this category will be $5 billion in the next decade. We think it’s going to be much bigger than that. If you’ve read this far, perhaps consider signing up for our Newsletter? MR: Is Plated profitable and does it matter to investors your profits? NT: We are profitable on a unit basis, meaning we make money on every box that we ship out, but as a business we are not yet profitable. For the right investors, for the investors we’re talking to, you guys don’t want us to be profitable today. That would mean we are returning dollars to you guys instead of investing them in future growth. MR: I’ll take five billion in sales and profits if I can have that. MR: The all-important, what should you wear? What should you wear when you go pitch a VC for the first time? What’s the right look? NT: It’s an interesting question. It’s sounds a bit flippant but it really isn’t. When we first starting going out and raising money, I’d put on the Goldman Sachs suit and the tie and go and talk to people. I actually think you lose a bit of credibility, at least in the venture space, if you’re in a suit and tie trying to raise money. I’ve found that, over time, the more homeless I look, the higher my probability of raising money. MR: The investors want to see that you’re working so hard you haven’t had time to shower or shave. NT: Exactly. Literally we roll into most of our meetings in t-shirts and jeans. Sometimes I won’t shave for weeks at time. I haven’t cut my hair in almost a year. So much of life is finesse and optics, but there’s definitely something to be said for we are more focused on the business than on what we’re wearing. MR: At Founder Collective we score every entrepreneur on how disheveled they look. The more disheveled, the more likely they are to get funded. Nick, I get to see you a lot in the business contexts and in board meetings, but it’s great to just retell the story and hear all those stories that I hadn’t heard. NT: Yeah. This was fun being in this soundproof room with you. MR: We have a future in radio together. NT: I hope so. I hope. This was fun. I want to do this again, yeah. MR: This was fun. Thanks for coming. This is really quite special, and you’re our first guest. You’re an early adopter and thank you. MR: Cool. If you have a startup idea and want to give the process a shot, hopefully we didn’t scare you, reach out to us atinfo@foundercollective.com. You can follow us @fcollective and my Twitter handle, @micahjay1. And if you like what you hear, subscribe to us on iTunesand leave a nice review. It helps.